Trade shows can be valuable venues for meeting new prospects, connecting with customers, promoting your brand’s offerings, and discovering new opportunities. But since trade shows demand an investment of time and money, you want your exhibit to deliver a maximum return on investment. For tips on making your trade show exhibit a worthwhile in every way, SkylineTradeShowTips.com offered these six strategies. 1. Let Lead Generation Be Your Leading Priority – Leads are your lifeline to business, so your ability to gather leads is vital to your growth and success. Your purpose for presenting is bring in new business, so it’s important to design your booth to attract the right audience. You must also have your staff focus on the goal of generating qualified leads. 2. Set Your Sights on a Prime Site – Traffic is a top concern when picking the place for the booth. More traffic means more chances to pursue and engage attendees, so ask about high-traffic sites when reserving your location. Be aware that corners are high-traffic hubs that allow exposure from all directions and let you stand out from the crowded rows. But your site is only as good as the display within your booth. You’ll find that the small expense of an expert exhibit designer can make a big difference in your ROI. 3. Make Time for Training – Your staff may serve as the first impression of your company. That’s why your people must present your brand professionally and properly while performing their staffing duties. Their role includes connecting with attendees, qualifying leads, and securing correct contact information. But these tasks demand training, so teach your staff how start up conversations, learn prospects’ problems, and present your brand’s solutions. It all comes down to asking the right questions, listening and learning, and then presenting your brand as their answer. 4. Be Proactive About Promotion – The phrase, “If you build it, they will come,” unfortunately doesn’t apply to trade shows. It’s not enough to just set up a booth, you must promote your trade show exhibit to get people to your booth. Start months before the actual show by emailing all of your contacts, as well as promoting your show through direct mail, and sharing the news on social media. Then, post updates throughout the planning process and build attendees’ anticipation by offering in-booth promotions and giveaways. All of this hype will generate buzz and lead to a better turnout. 5. Give Out Good Giveaways – Gifts and goodies will bring people into your booth and these handouts can help out your overall efforts. But if your freebies look too frugal, they can make your brand look bad. The secret to good giveaways is to offer products that attendees will retain and reuse, such as coffee mugs, computer accessories, or flashlights, all with your company’s logo. Then, every time they reach for your gift, your brand is reaching your prospect. 6. Follow Through with Follow Up – While lead generation will set you up for success, follow-up will take you down the path to conversion. Surprisingly, only 47% of salespeople follow up on leads after a show. And since leads have a limited life span, follow-up must occur within three days of the show or that lead will lead to nothing. That’s a waste of both time and money because following up is the only way to have something to show for your trade show effort. 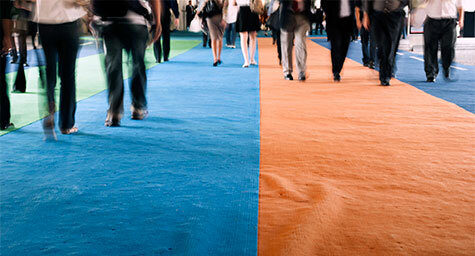 Trade shows can bring in a world of business and truly make a world of difference in your brand’s success. Keep up with the trends in trade show marketing. Contact MDG Advertising. MDG Advertising is a full-service advertising agency and one of Florida’s top branding firms. With offices in Boca Raton and New York City, MDG’s capabilities include branding, logo design, print advertising, digital marketing, mobile marketing, email marketing, media planning and buying, TV and radio, outdoor advertising, newspaper advertising, trade show marketing, video marketing, retail marketing, website design and development, content marketing, social media marketing, and SEO. To discover the latest trends in advertising and branding, contact MDG Advertising.